Made in our bakery, this delightful pair of cheesecakes is sure to make everyone smile. 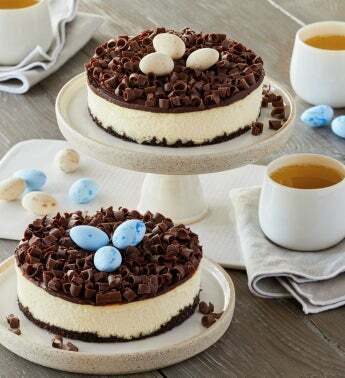 Topped with dark chocolate ganache, dark chocolate curls, and candy caramel eggs is a layer of creamy New York-style cheesecake on top of a dark chocolate crumb crust. Please note eggs will vary in color.